Snow Monkey Tours run everyday from December 14th 2019 through to February 29th 2020 and every Monday, Wednesday, Friday & Saturday from March 1st to March 30th, 2020. No Tours on January 1st. Customers can board the bus at Rhythm Rentals Wadano from 07:45 after the sign-in and processing. 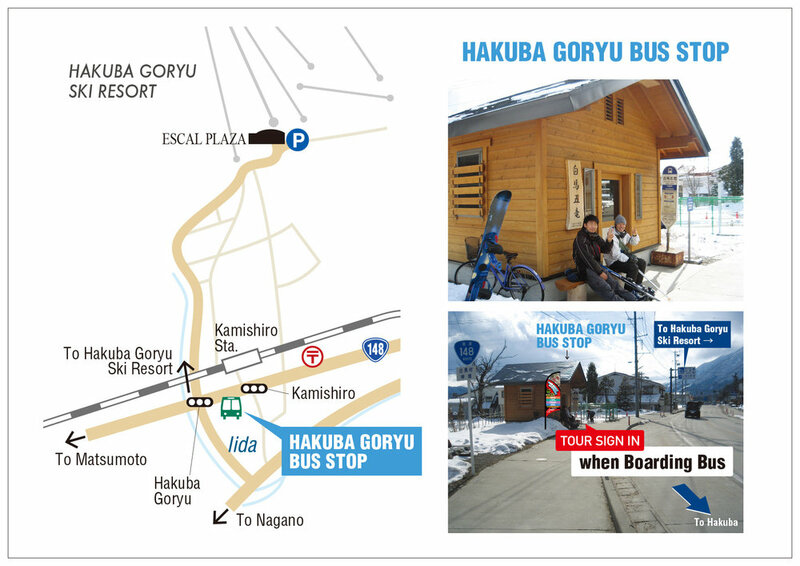 The bus will depart at 08:00 sharp, then depart the Happo Bus Terminal at 08:05, Hakuba Base Camp Echoland at 08:10, followed by Hakuba Goryu Bus Stop (on route 148 opposite Kamishiro Station), departing at 08:20. If the ­first bus is sold out we will make arrangements to run a 2nd bus. Customers with travel agency pre-paid vouchers please present these to the sign up staff on the day the tour is booked for. The cost of the tour is 13,000 yen for adults, 9,000 yen for children ( 3-11yrs ). Children 2 years or younger are free to join the tour, however will receive no lunch and will share the bus seat with the parent. Baby seats cannot be provided by the bus company. BOOK ONLINE at www.snowmonkeytour.com or call Ski Japan Holidays on 0261 85 8009 at least 1 day before the commencement of the tour. Seats are limited and advanced bookings are necessary. Tours can also be booked at your place of stay in Hakuba. MasterCard or VISA are accepted, cash payment in yen is possible on the day of the tour. Booking cut-off time is 17:00 on the day prior to the tour departure. Tour is inclusive of all transportations to & from place of original pick up location, English speaking guide throughout duration of the tour, entry fee of Monkey Park, and set lunch menu as chosen by customer. Any other expenses or access/entry to other areas whilst customer is on the tour are to be paid by the customer. The walk along the forest path to the Monkey Park takes approximately 30 minutes each way. Make sure you have non-slippery shoes/ winter boots, warm clothing, gloves & beanie, as you are walking over snow and it can get VERY COLD. Snow cleats and winter boots can be available at the monkey park souvenir shop. Lunch is at a Japanese restaurant in the historic town of Obuse. For the Japanese set menu, adults have the choice of Beef, Fish or Vegetarian. Fuji apples and a sample of sake is also included for you to try some local taste. Children’s meals are mixture of western and Japanese style set menu, vegetarian option is also available upon request. Please inform any food allergies ahead of time and we will do our best to cater to them. 17 passengers *In case the minimum number of participants has not been reached by 5:00 p.m.one day before the tour date, the tour will be cancelled, and customers may choose refund or allocation to another date. In case of cancellation of the tour after commencement due to natural disaster or accident, refund will not be provided. Minimum numbers apply. Ski Japan Holiday reserves the right to change or cancel the tour; in the case of cancellation we will attempt to contact all customers to arrange rebooking or refunds. This document forms described in article 12-4 and 12-5 of the Japanese Travel Agency Law. This document explaining the terms and conditions becomes biding once the contract is complete. 1 Responsibility rests with Ski Japan Holidays operating Agent-Organized Tours (hereinafter referred to as the SJH ) whose name in full appears below and in its tour pamphlets. Customers joining such tours shall conclude an Agent-Organized Tour Contract (hereinafter referred to as the Travel Contract) with SJH. 2 SJH shall provide tour arrangements and itinerary management so that the Customer receives tour services including transport/accommodations (hereinafter referred to as "tour services") provided by transportation/accommodation operators during the tour itinerary set by SJH. 3 The content and conditions of the contract shall conform to those specified for each tour itinerary, conditions as specified hereunder, the final itinerary handed to Customers before departure (hereinafter referred to as the "Final Tour Itinerary"), and Agent-Organized Tours as described in SJH's general terms and conditions as based on the Travel Agency Law (hereinafter referred to as "General Terms and Conditions of Agent Organized Tours"). 1 The Customer shall provide information on SJH application form as required by SJH and submit the form together with the necessary reservation fee. Paid fee shall be applied to the tour Fee, cancellation charges or penalties. 2 SJH may accept applications for travel contracts by telephone, mail, facsimile and other means of communication. In such cases, the Customer shall submit the application form and reservation deposit to SJH within 3 days counting from the day when acceptance of application is confirmed. If the Customer fails to supply the required application form and fee within 3 days, the reservation shall be voided. 3 The Travel Contract shall become valid upon SJH's consent to the conclusion of the contract and receipt of the full tour fee. If tour arrangements are made by phone, the Tour Contract shall become valid upon SJH's acceptance of the tour fee as specified in the Clause 2. When Customers request tour arrangements by mail, facsimile or other communication methods, the tour contract shall become valid upon full payment of the Tour Fee and SJH's notification of acceptance of the tour contract. The contract for any tour request by any communication including telephone, mail, facsimile or other shall become valid as specified in Article 23-2. 4 When applying for group tour arrangements (more than 2 people), the tour contract including conclusion and cancellation of the contract shall be exchanged between SJH and the group representative. 5 The group representative responsible for the contract shall provide SJH with the name list of members by the date specified by SJH . 6 SJH shall not be responsible for any responsibilities or obligations the group representative holds in the past or in the future. 7 In case the group representative does not accompany the group, we shall consider one of the members who have been selected by the representative as the group representative who is responsible for the contract after tour starting day. 8 If the tour contract cannot be finalized due to full occupancy in seats or rooms or other reasons at booking, SJH may ask the Customer to wait until the specified date with his/her consent. (This booking status shall be referred as " waiting" hereinafter.) In this case, the Customer shall be registered as "waiting Customer" and SJH shall make an effort to make it bookable. Even in this case, SJH shall charge the Customer the tour fee ( "Waiting" does not guarantee confirmation of booking). However, if the Customer requests SJH to release the waiting, or if the booking is not confirmed until the specified day, SJH shall return a full of the tour fee. 9 Even in case of the Clause 8, the tour contract shall be finalized at the day when SJH informs the guest of the confirmation. 1 A Customer under 20 years of age traveling alone during the tour period shall provide SJH with the written consent of his/her guardian. Customers under 15 years of age must be accompanied by a parent or guardian.